Please support this blog by occasionally clicking on sponsor ads. Don't forget to subscribe to this blog by clicking on the RSS feed icon under "SUBSCRIBE TO"
Taking the leap: investment funding, patent strategy, and going for it! The next few months will mark a huge milestone in my life as myself and my friend and business partner, Chris, launch into the world, a concept that I have been developing for the last 7 or 8 years. We're going to make advanced brain activity and biometric data analysis available to the world in an inexpensive and easy-to-use way. It's really exciting and encouraging how so many things both personally, economically, and market/culturally have aligned at this very moment. Good things are coming. Thank you everyone for your support!!! Below is a poem I read in 1998 that inspired me; I refer to it often. I'm currently in Denmark having meetings and working on the experimental design for a language learning research project where we are investigating the relationship between brain function and language learning ability. I've recorded a few videos and took a picture or two. Take a look at the raw video footage if you're interested in a "taste" of the Copenhagen shopping district on a rainy day. ENJOY! In addition to simply investigating foreign language learning, we will be investigating how tailored neurofeedback methods can be used to affect foreign language learning ability. Soren Andersen, of Peakmind, will be providing expertise for the neurofeedback component of the study. We will be using the EEG modeling methods I developed at the University of Victoria (MOST - EEG) to begin to identify systems of the brain that are active during language reception and production at at various stages of learning. Our hope is that we will see at least 2 different learning strategies based on classification of our brain function data. In addition, we hope to see how changes induced by neurofeedback methods affect the brain function associated with these different strategies. I've posted a few pictures of Denmark below. Enjoy! We are now posting some of the results that we found from our altitude investigation on Mount Kilimanjaro. For the purpose of explaining these results to the lay-person, a colleague of mine has given his own interpretation of the results (why the graphs below look the way they do) and his own experience at altitude intermixed with my writing below. Phil: Some of the early results of our altitude experiment are illustrated in the following plots. Essentially, the data speak to the idea that what I would call "intense" pressure breathing and rest stepping contributes to larger SPO2 levels than moderate to no pressure breathing. Note that this assumes that all persons from whom data were collected are somewhat similar in physiology related to oxygen transport from the atmosphere into the blood. The data collected are from males between the ages of 35 and 57 years of age. (No significant correlation of hiking SPO2 with age was found (corr=-0.72 n=4; -0.95 would be required for n=4 at p=0.05). Measurements were taken so as to not distract (too much) from their hiking experience although each time a measurement was taken, that hiker was informed of their SPO2 level and heart rate and encouraged to keep their SPO2 numbers high. You will note in Figure 1 that a different number of measures were taken each day. The values in Figure 2 were calculated using a daily average (for each of days 2, 3, and 4) so as not to weight one day more than another in the statistics derived. 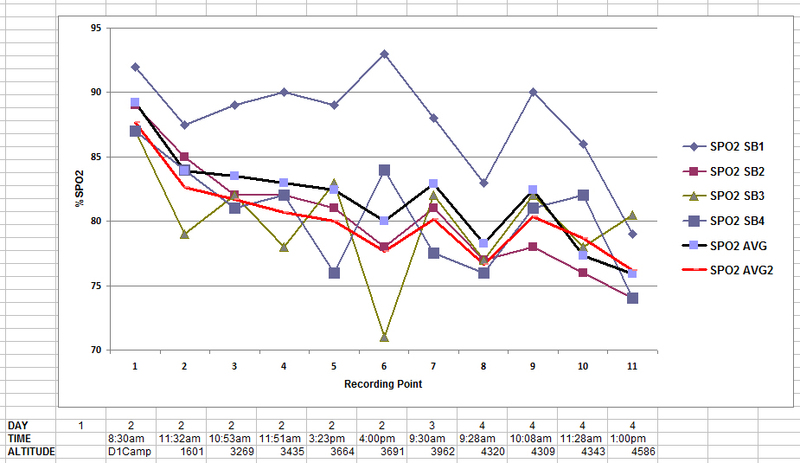 Hiking SPO2 data were not recorded for day 1 or our final ascent on the summit (day 5). Figure1: (click image to enlarge) SPO2 levels for various measurement taken while moving during the hike up on Kilimanjaro. 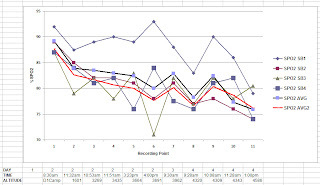 SPO2 AVG indicates the average calculated across the group at each for each recorded point. SPO2 AVG2 refers to the average calculated across a subset of the participants (SB2, 3, and 4). Figure 2: (click image to enlarge) Comparison of hiker SPO2 levels and the typical "home" SPO2 for "hiking" and "resting" conditions. In the hiking condition, persons were stepping with approximately the same weight backpacks and where moving forward at approximately the same speed (as a group). In the resting conditions, persons were seated in a chair (at the end of a day of hiking) for approximately 20 minutes before the measurement was taken while seated. Noticeably, the hiker (SB1) indicated by the blue bar of the left-side of this figure does not have standard error bars that overlap with those of the other hikers. When listening to the breathing of all hikers, SB1 was doing noticeably much more intense pressure breathing than the other 3 hikers. During the post-data collection interview, hikers SB2, 3, and 4 indicated that they were not confident in the pressure breathing process and adopted their own versions of pressure breathing that they preferred. SB1 is the youngest hiker (age 35) out of a relatively even spread of age across the group however given how the SPO2 levels fall towards those of the main group in that hiker when intense pressure breathing is not used (data not provide), it is unlikely that age is a differentiating factor. In addition, hiker SB2 is only 5 years older than SB1 and SB2. Comparing Figures 1 and 2, for participants SB2,3, and 4, one notices that the "resting" SPO2 levels are higher than the "hiking" SPO2 levels. (For SB1, the resting SPO2 level was comparable to the resting SPO2 of the other climbers; data not provided). Two things are noteworthy in this comparison. First, the SPO2 levels for SB1 doing intense pressure breathing while hiking fall in the range of SPO2 levels for resting suggesting that this hiker maintained "resting" levels of SPO2 even though he was working physically to get up the mountain. Second, hikers SB2, 3, and 4, had significantly lower SPO2 levels while hiking than they did while resting. This suggests that they might have more cognitive impairment (and be facing additional physiological issues) while hiking than while resting. That said, it isn't clear what impairment might continue into the post-hiking period (while resting) from the low SPO2 levels experienced while hiking. There are two additional pieces of information that we do not have data for that would impact altitude health and cognitive function: tissue CO2 levels, and a measure of blood vessel dilation in the brain that is related to CO2 levels. I briefly describe why these measures are important in a post on my company website and why we should collect these data next time. If you haven't quite figured it out yet, SB1 refers to data collected from myself. I am the one that is concerned about having my own oxygen levels fall and any subsequent lasting cognitive impairment related to altitude and mild anoxia. Bringing this into perspective, this whole investigation is about figuring out how to enjoy very high mountains safely and understanding how the tools we are presented with (in this case, pressure breathing and rest stepping) impact our altitude health and our health thereafter. Gord: (the 57 year old member) what does SPO2 stand for Phil? That was a great hike! As a novice at altitude, I kept wondering what the teams who blasted past us on the trail were doing (if anything) about the ever-increasing effects of higher-altitude. My experience with having my SPO2 levels regularly recorded was that I variously felt like a) I'm in a scientific experiment b) I'm striving to reach a huge goal c) I'm on a team going for the top and not just doing this for myself. While being "in an experiment" mode I really did consciously change my breathing to bring my SPO2 levels up. Two reasons - I'm a bit competitive in a team environment AND I wanted to avoid the experience of suffering AMS again. In the end I really believe that my rest-stepping and increased breathing helped get me comfortably to the summit. Those techniques helped me feel more in control of the outcome rather than wondering if I was going to one of those who arbitrarly gets dragged off the mountain. The first graph (fig 1) moves up and down depending on the steepness of the trail (if I remember correctly) and, for me, what was going on in my head at the time. Distractions meant lower breathing rate, which is my natural tendancy. The lines heading down to lower SPO2 levels with higher altitude make sense. Our scientist's encouragement to stay above 80 finally sunk in on summit day for me. Before then I felt strong and capable on my own. On summit day I knew that any tool which increased the odds of making it to the top without getting AMS was worth adopting. BTW I finally figured out what "pressure breathing" was (for me) on the way DOWN from the summit. Before then I was just breathing as deep as I could. I'm not yet sure how to describe it in words. I do know it sounds like what I imagine a steam engine sounds like. More to come on that later. Phil: SPO2 stands for "Saturation (peripheral) of haemoglobin with oxygen" which is a percentage ratio compared to fully saturated haemoglobin. Basically, it is how filled your red bloods cells are with oxygen. At our home altitude (sea-level) we measure approximately 98%. Of course, these meters often have a error of 2%. At any rate, we're close to complete saturation at our home altitude. On our final ascent towards the summit of Kilimanjaro I distinctly recall 2 things: some people being helped down the mountain by their guides, and every once and a while reminding the team about their oxygen levels. On our training hike to the summit of White Mountain Peak, I recalled that SPO2 levels below 60% were definitely bad news (at least for us tourists at altitude). Again, on that particular ascent I wanted to look after myself so I worked to maintain an SPO2 above 86%. That said, I picked that number because I seemed to be OK there. I don't know if it is a good guideline; we will get more data on this topic. What I have noticed for us is that levels in the 80% seem to relate to some mild cognitive changes (we joke around a little more, things are funnier, my sense of time is way off), in the 70s there is some distinct drunkenness (altitude drunk), loss of balance, and loss of body awareness, and in the 60s loss of color in the skin and look a bit ill. After we got back to Victoria from White Mountain Peak, I found this information about SPO2 levels on the internet (http://www.anesthesiaweb.org/hypoxia.php; I have not verified the information at this link). The information on this site seems a bit arbitrary because they have put the boundaries of the altitude effects on body function in steps of 10%. Still, it supports the idea that we want to keep our oxygen levels high. I noticed that if I got into a conversation with someone while hiking, my oxygen levels would drop quite quickly. I talked to one of our guides for a while in French and it seemed really easy (I speak terrible French at sea-level; presumably it was equally terrible at altitude). It is easy and even fun to get 'distracted' from breathing. On one of the days I borrowed a porter's radio, gave him my camera to make video recordings, and then rocked-out to Shaggy for a good 10 minutes (or something like that; remember that I seem to have poor sense of time at altitude). While I was up to these antics, I was not pressure breathing (or taking measurements). That said, I did this for a relatively short amount of time. The descent at the end of the day as the sun was falling was 'interesting'. I remember measuring some "too low" oxygen levels and noticing the temperature fall. I was genuinely concerned about getting back. And we did- we did get back to our camp and crashed-out in our chairs for dinner. The guides and our support team did a fantastic job getting us down safely and supporting our recovery. On the morning of September 1st, 2011, shortly before our flight leaving Seattle for Amsterdam and then eventually Kilimanjaro airport, Emily McIntyre gave our team of four men a short explanation and demonstration of pressure breathing and rest stepping that she herself had learned prior to a recent ascent to the top of Mount Rainier. (See wiki describing the rest step http://en.wikipedia.org/wiki/Rest_step .) Ten days later on September 11th, 2011, we used pressure breathing and rest stepping to make our final ascent and subsequent descent of Kilimanjaro. Prior to that impromptu lesson in that Seattle eatery, I had not seen pressure breathing and the idea stepping in the manner shown to us would have not occurred to me. Thank-you Emily. It all make sense however; use your lungs -- completely--, and at the end of each exhale, create negative pressure in your lungs, and move very, very efficiently. If you have an SPO2 meter you can actually see how subtle variations in breath style and moving style change your hemoglobin saturation. I found that there is a big difference between my "walking" SPO2 and my "standing" SPO2 at 3000 meters. There is an even larger difference above 5000 meters. Simple limb movements use oxygen in ways that you can see it on the meter. One of the striking characteristics of pressure breathing is the frequency of breaths per step and how the ratio of required breaths per step actually changes depending on the altitude. At approximately 4000 meters, I had to take 2 or 3 steps per breath-- if I took fewer steps, I would actually get light headed. If I didn't pressure breath while I was moving, my SPO2 levels would drop to the 70's. If I pressure breathed my SP02 levels were in the high 80's. Let's just say that I maintained my levels in the high 80's and low 90's for my own health and fear of "brain fog". 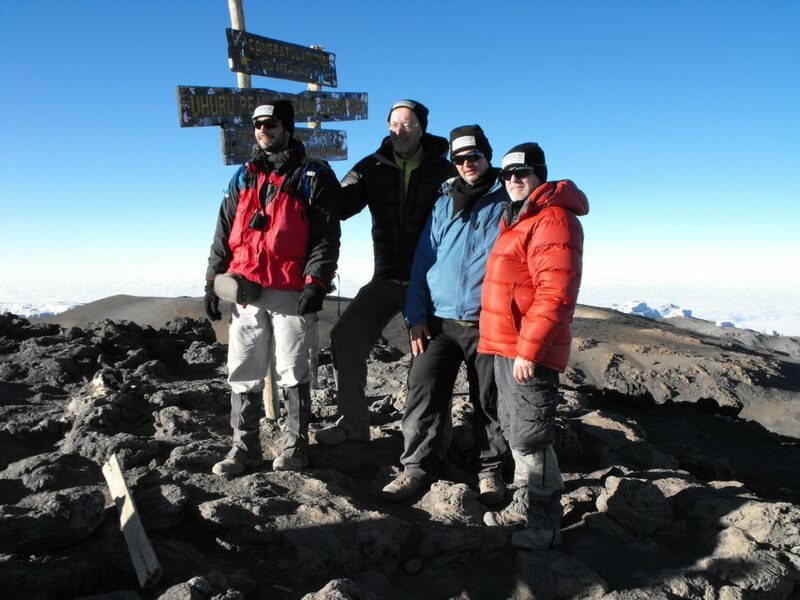 At the summit of Kilimanjaro, I actually was completely comfortable doing 1 pressure breath per step and by doing so, I could maintain a level of 86%. To get this high of an SPO2 however, I was required to move very, very efficiently. As soon as I would increase my stepping rate, my SPO2 levels would fall. Taking a very big breath and exhaling at sea-level over and over again is nearly impossible to do at sea-level -- I've tried. At sea-level it actually makes me want to puke and fall over sideways. All four persons on our team are in good health after our Kilimanjero expedition. We will be disseminating information in the weeks to come. This trip was a sucessful marriage of science, adventure, endurance, perseverance, decision making ability, self-preservation, preservation and care of others, and strength of character, while under the burden of both physical and emotional stress. I seem to be well-suited for this type of activity; I found this challenge very revealing of myself, to myself, and to those around me. I found that my activities of pressure-breathing and rest-stepping kept my hemoglobin saturation levels high and I retained my health and decision-making abilities. I will be posting some very informative data when I return to the office. After a good number of days of preparation, I finally managed to fit all of the research equipment and my own clothing and survival gear into 3 sacs. The ferry for Seattle leaves in 1.5 hours and I'll be on it! Our official sponsors for this project include: Johnson and Johnson, Stepforth Web Marketing, and the University of Victoria. Thank-you for your help towards making this project happen.